Fascinating visions: Hiroshige and Turner in Rome. Review by Carla Scarano. Views of different countries combining practical observations and ideal visions are the focus of two major exhibitions occurring in Rome: Turner: work from Tate and Hiroshige: visions from Japan. They are topographies of the mind, a bridge between real and ideal, facts and imagination, a way to translate and understand reality. Chiostro del Bramante near piazza Navona is a work of art in itself. Its classical round-shaped façade is situated at the end of the narrow street of via della Pace. When you enter it opens in a squared two-storey cloister with arcades supported by pillars immersing the viewer in an ancient Roman architecture rigorously balanced and devoid of any unnecessary decoration, according to the purest Renaissance style. Turner’s exhibition is arranged into six sections displayed on two floors meandering in the small and larger rooms and corridors of this fascinating venue. The works are a selection of about a hundred pictures, mainly watercolours, from the Turner Bequest, the unsold works Turner had kept for himself and had left to the National Gallery in his will. They amount to about three hundred oils and thirty thousand works on paper in total, now at Tate Britain. Ruskin used to say that Turner had composed these works for ‘his own pleasure’, but maybe he had thought of displaying them considering the fact that he donated them to the state eventually. The exhibition follows a chronological order though some important pieces, such as ‘Lagoon at Sunset’ (1840) displayed in the first room show how Turner’s experimentation on light and colour was paramount in his art. The importance of landscape in Turner’s work is stressed since the first rooms with sketches of views of England and Wales where Turner travelled extensively during the summer to take inspiration for his finished works which he developed afterwards at home. In his paintings the ideal landscapes of Claude Lorrain and Nicolas Poussin become rooted in practical experiences deriving from the direct observation, according to the empirical methods developed in the 18th century, and the attentive recordings he made during his sketching tours along the Western side of the Thames valley and across Northern Wales and Scotland. Thus the landscape is not only the background for History paintings, which represented mythological or biblical stories or classical historical scenes highly considered by Academies, but acquires an importance of its own. In Turner’s work landscapes convey emotional meanings, express national identity and comment on society and human conditions. This experimental nature of his work is highlighted throughout the exhibition both in terms of themes and techniques. In fact, sometimes he used oils for sketches instead of watercolours and inserted mythical figures, which were usually found in oil pictures, in watercolour works. The use of the two techniques seem to converge or compensate each other in an open approach, a dynamic perception typical of modern artists who are self-conscious of changing historical moment. Turner’s time was a period of commercial and political expansion for Britain which produced a new rich upper class that supported art and culture, a new audience that sponsored artists like Turner, similar to what happened in Florence during the Renaissance. For this audience Turner produced not only finished History paintings and landscapes, which he regularly exhibited and sold at the Royal Academy, but also engravings for travel and guide books, and illustrations for literary oeuvres of popular writers, such as Sir Walter Scott, Samuel Rogers and Lord Byron. This assured him a stable financial income, similar to publishing for writers, which made him a wealthy man. The exhibition’s selection of paintings he produced during his travels in Italy and in the Alps is carefully and deftly chosen, giving a clear idea of Turner’s way of working. He travelled abroad in 1802, in France and Switzerland, but could not visit the continent again till 1817 because of the Napoleonic wars. He was in Rome for two months also travelling in the countryside till Naples and Pompeii, and he visited Venice three times. He visited the Alps again and Germany taking inspiration from Italian, French and Dutch painters, and exploring the landscape in his topographical tours. In works like ‘Venice: San Giorgio Maggiore, early morning’ the coloured washes he applied in thin layers are carefully worked in minute touches using thin brushes or scratched paint away to create effects of light and transparency. In his innovating technical experimentations, he mixed white gouache to realize opaque areas creating a shifting effect of light and shadow that produced a sense of movement and depth he also theorized in his lectures on perspective held at the Royal Academy, an illusion of depth created by colours as in ‘Mont Blanc’. Turner’s legacy is clearly explained as well; his influence on some famous modern and contemporary artists was paramount. Painters such as Claude Monet, James Turrell, Cy Twombly, Olafur Eliasson and Mark Rothko were affected by Turner’s art. The emotional use of colours and his experimental work in the open air creating a new involvement with the viewer, seem to be the main sources of influence he left to his followers. This leads to the final section of the exhibition that comprehends a series of videos from the Tate, subtitled in Italian, explaining Turner’s techniques through visual, practical examples, and in the video installation by Fabien Ilion and Paky di Maio, ‘Memories of Bamburgh’, inspired by Turner’s late watercolour ‘Bamburgh castle’. The video installation brilliantly translates Turner’s emotional vision in sounds and moving coloured shapes suggesting in a contemporary 3D means what the artist had accomplished simply using layers of watercolours paint on paper more than a century and a half ago. His later work definitely underlies once more his personal perception of the natural world infused with imagination yet rooted in attentive observation translated in a vision where forms dissolve into colours, in an almost abstract way. Further to his own experimentation with colours, he was also influenced by Goethe’s theory of colours, which was based on human perception rather than scientific empirical evidence. According to Goethe, colours have an emotional impact that can symbolize and convey different feelings such as happiness, anxiety or horror. In Turner, not only the colour itself communicates emotions, as in his extensive use of yellows, but also in the way he used it, for example in the thick layers of oil paint in ‘Venice quay, Riva degli Schiavoni’, or in the apparently shapeless blotches of pigment, like in ‘A Wreck, Longship Lighthouse, Land’s End’, revealing his free interpretation and superb control of pictorial techniques in a quasi dream-like vision whose aim was, in his own words, ‘to show what such scene was like’. The exhibition ends with a last comment from an article by Francesco Bonami (Donna Moderna, 2018): ‘Se non ci fosse stato un signore inglese di nome William Turner, i francesi non avrebbero avuto l’Impressionismo’ (If there hadn’t been an English gentleman called William Turner, the French wouldn’t have had Impressionism). Hutagawe Hiroshige was a contemporary to Turner; he mainly depicted landscapes as well, though his vision developed in very different shapes and colours. The exhibition at Scuderie del Quirinale displays two hundred and thirty works from his early productions to the latest mature pictures. Central to his artistic career and fame are the ‘Fifty-three Station of the T?kaid?’, the costal route between Kyoto and Edo, today’s Tokyo. Hiroshige was born in Edo and travelled on the T?kaid? road in the summer 1832 drawing sketches, meeting people and recording incidents. In his time, it could take from one week to a month to complete the trip depending on the weather conditions. It was a slow-paced society compared to today’s bullet train, the Shinkansen, that runs the same route in about two hours. Japan was a feudal state at the time, so the traveller had to cross borders and show visas along the road. The fifty-three stations were mainly inns or places where the pilgrims could stop, rest and socialize. 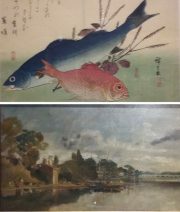 Hiroshige’s complete drawings were published as woodblock prints a year after he made the tour, and were a great success which changed his artistic career. They not only represent famous buildings, mountains, rivers and trees, but he also imagined the views in different seasons (though he travelled there in July) creating his own vision and inserting the travellers he had encountered along the road giving a vivid picture of Japanese society. He was considered a master in depicting rain and snow, the changing of the seasons that have a great influence on human life, especially in a rural environment. Therefore, a reflection on the beauty of nature and on life is mixed with a sense of sadness in the awareness of the passing of the seasons and the transience of every creature. His work shows the influence of Kanga, a Chinese style, and of his great predecessor, Hokusai, as in ‘View of the Sea at Satta’, which reminds of ‘The Great Wave off Kanagawa’. But Hiroshige managed to combine these different styles in his own vision depicting the restricted society of feudal Japan and conveying a perception of variety at the same time. His sense of poetry is expresses in the famous series of ‘Large Fish’ where he combines poems and images with an extraordinary realism and sense of movement. His pictures are visual as well as intellectual, aesthetically commenting what he sees. The works on display are mostly woodblock prints from Hiroshige’s original sketches. A video explains in details how these prints were produced involving the collaboration of four people: the publisher, who commissioned the work, the artist, who made the drawings, the block-cutter, who cut the key-block and the colour-blocks interpreting the artist’s work, and the printer, who shaded the colours. Therefore, what we see is not the direct production of one artist but the result of a collaboration. Blocks were reprinted so often, as in the case of Hiroshige’s ‘Fifty-three Station of the T?kaid?’ which was a bestseller, that the woodblocks had to be recut, so they were probably re-interpreted and partially modified. On the second floor the exhibition displays later works comprehending parodies of historical events, such as ‘The Battle of Rice Balls and Sake’, referring to a battle for the succession of power in the 12th century, and illustrations of mythical stories, such as ‘Taira Kiyomori seeing Ghosts’. The most famous series of his last years is the views of Edo, called ‘Meisho Edo Hakkei’, a hundred views of famous places, published between 1856 and 1859, a year after his death and completed by his adopted son Hiroshige II. These pieces have a unique perspective well explained in the captions, where an object or an element in the picture is exaggerated in the foreground, such as maple leaves or the branch of a tree; they are magnified in close-up and the rest of the view is seen from this lens. It is an asymmetrical point of view that Hiroshige had already experimented in his previous landscapes but brings to fruition and attains extraordinary novelty in this last series. This vision of giving relevance to minor details surprises the viewer and can be interpreted as both an optical illusion and as a way to closely relate common people’s life to ordinary objects, which are apparently insignificant but actually reveal themselves to be more important than a wider view. Furthermore, it is the perspective through which we can look at a wider view, which instead can be the real illusion. Hiroshige’s work and Japanese prints had a great influence on Impressionist and Post-Impressionist artists inspiring a new vision of forms and use of colours in modern Western art.